Stoney was born smiling and never stopped. He is always happy to meet and greet each new day, each new person, and each new experience. Stoney has a joy for life that is contagious. He has a story to tell and delights in sharing it! 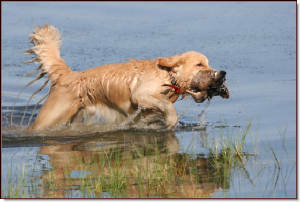 Stoney achieved a Springcreek first on September 20th, 2008, by earning his AKC Senior Hunter title with his trainer Paul Kartes of Lakota Retrievers (http://www.lakotaretrievers.com/) in four straight passes!!! 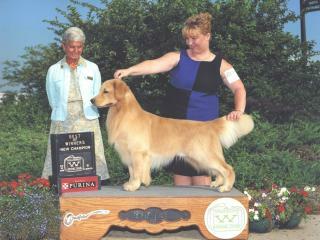 Stoney worked hard in November and December of 2008 competing in obedience and earned his U-CD and CD! 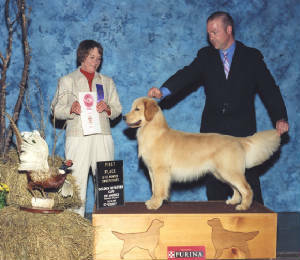 Stoney started his show career with RWD at six months of age and finished his championship right after his second birthday! 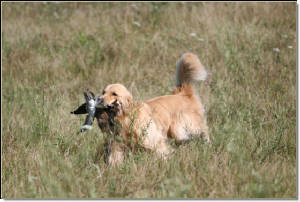 Stoney exhibits his gusto for life in the field as well as in the conformation ring. 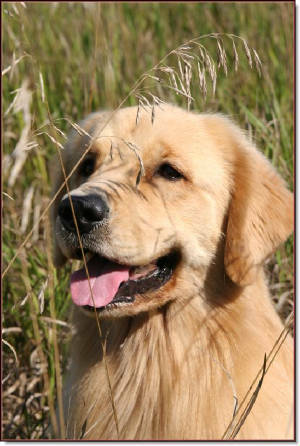 To view pedigree and clearances click here.